Although the fourth quarter of 2014 saw a decrease in archaeological activity compared to the fourth quarter of 2013, as a whole 2014 was on a par with 2013. Data Provided by the National Monuments Service indicates that in the fourth quarter of 2014 to the end of December there were just 56 new excavation licences issued in the Republic of Ireland. This is the lowest number of new licenses issued since I began tracking licenses quarterly in 2012. This also represents a decrease of 71% in comparison to the 96 licenses issued in the fourth quarter of 2013. Overall 2014 was just 2% behind 2013 with 462 licenses issued compared to 472 in the same period last year. In addition in 2014 there were 11 Ministerial consents for works, 46 diving licenses, 37 Ministerial consents for excavation, and 15 Ministerial Directions for excavation. The stagnation in archaeological activity contrasts with the expansion in construction output which has been sustained for more than a year. The Ulster Bank Construction PMI Report for December registered a statistic of 63.4 (a figure above 50 indicates expansion in activity), which indicates a continuing rise in construction activity. All the individual construction sectors are now growing, activity in civil engineering is at 57.4, housing construction is at 63.5 and commercial construction is at 65. The picture of expansion is supported by the Central Statistics Office which has reported an increase in the number of grants of planning permissions in the third quarter of 2014 to 4,238 from 3,875 in the third quarter of 2013, an increase of 9.3%. It is not clear why archaeology, which precedes development, should not be reflecting the strong growth seen in the Irish construction sector. 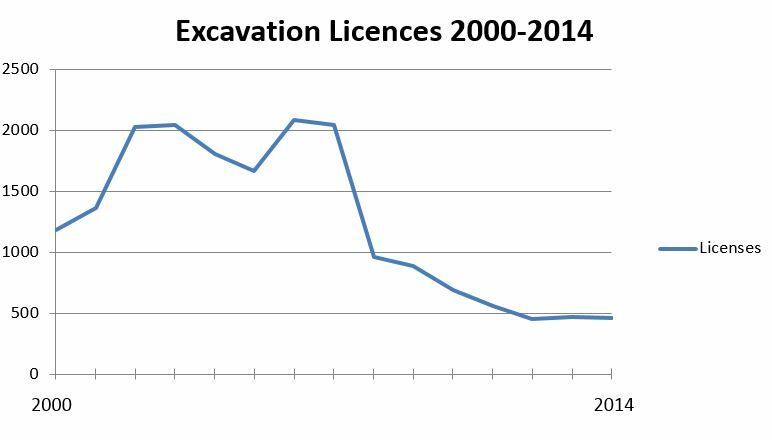 New Irish archaeological excavation licences on par with 2013. Indicators suggest that archaeological and construction activity in Ireland continued to decline in the third quarter of 2012. This entry was posted in Archaeology and tagged Archaeology, construction, Ireland by Charles Mount. Bookmark the permalink.